We love hearing from customers about their experience and are happy to share them here. The Osprey Standard has enjoyed a cult-like following for some time now from paddlers who enjoy its tracking and stability. Here is a handful of the letters we have received over the years. Thanks to all who took the time to share their experience with us! It’s been a year since I built my Osprey Standard and I just want to tell you how happy I am with it. I love how it handles and I love how light it is. I also like how it stands out from all the plastic and fiberglass kayaks that have no individuality. What I also enjoyed was building it. I couldn’t believe how nicely everything went together. Your instructions were complete and easy to follow. Building it was so enjoyable that I often forgot that when I was finished I would actually get to paddle it! 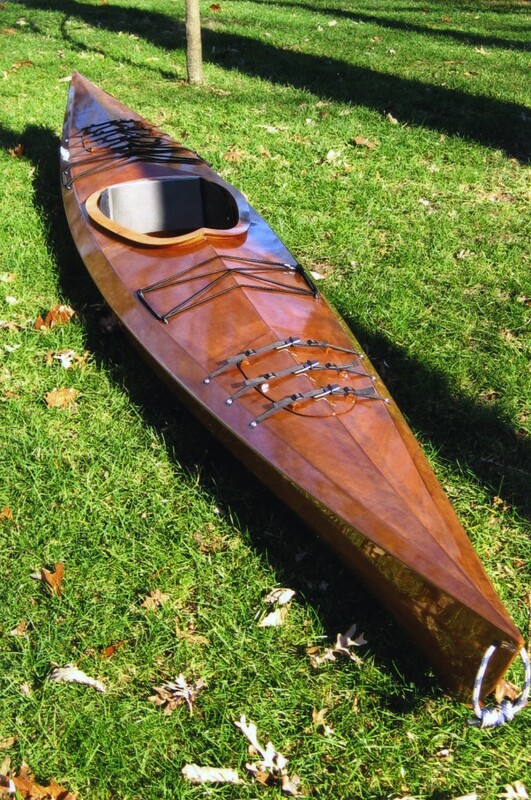 Actually, I enjoyed building it so much that I sent off for plans for a strip build kayak. I milled the strips but that’s as far as I got. There is so much more labor and time involved (300 hours) that it just couldn’t maintain my interest. 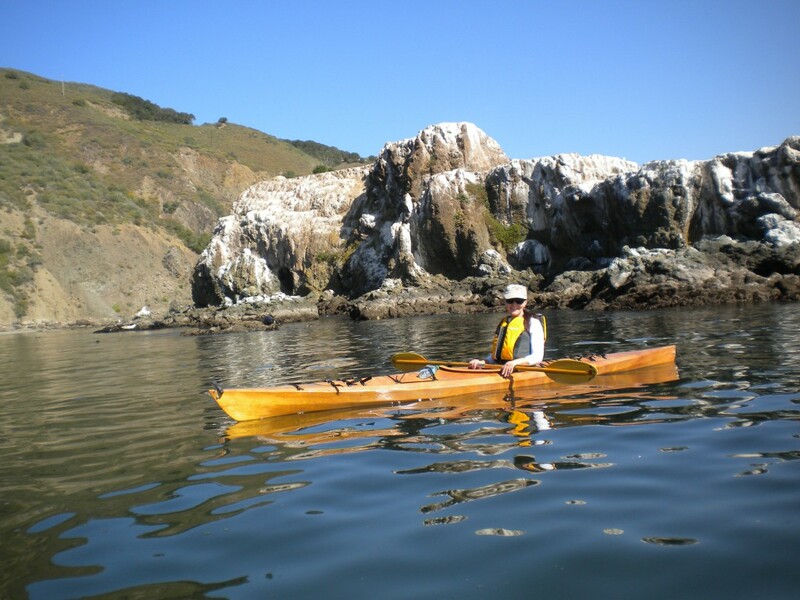 That’s what is so great about your kayak kits. You’ve done enough of the work to make the building of it fun and doable in a reasonable amount of time. 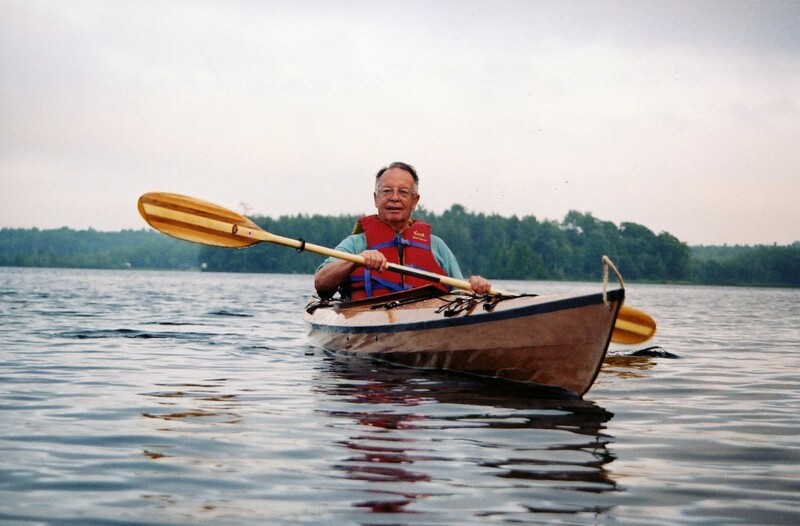 If I ever build another kayak, it’ll be a Pygmy. Enclosed I have sent several pictures taken at Watson Lake in Prescott Arizona of the Osprey Standard Kit I ordered in February of this year. The kit went together extremely well and took me approximately 82 hours to build including the installation of hatches, bulkheads and three coats of marine varnish. 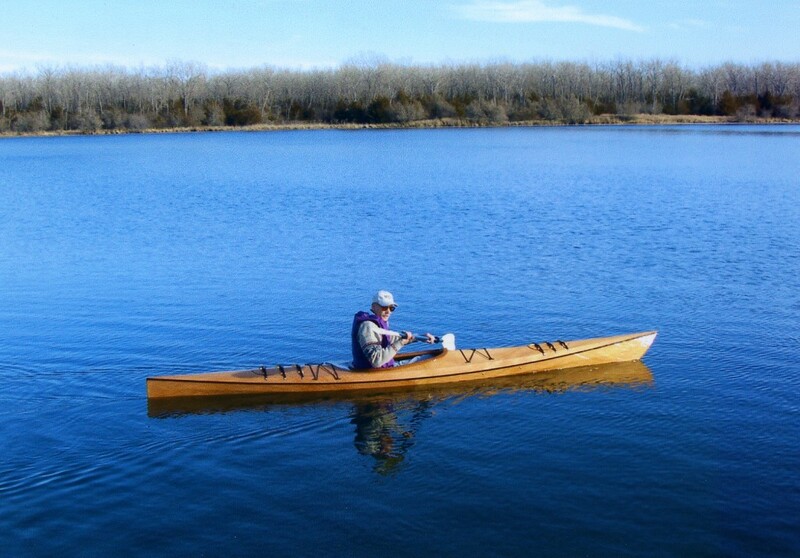 I have been paddling the kayak since March 25th and every time I take it out I get nothing but comments. One person told me if it were his he would hang it in his den and just look at it. It is an extremely nice looking craft that paddles every bit as good as it looks. 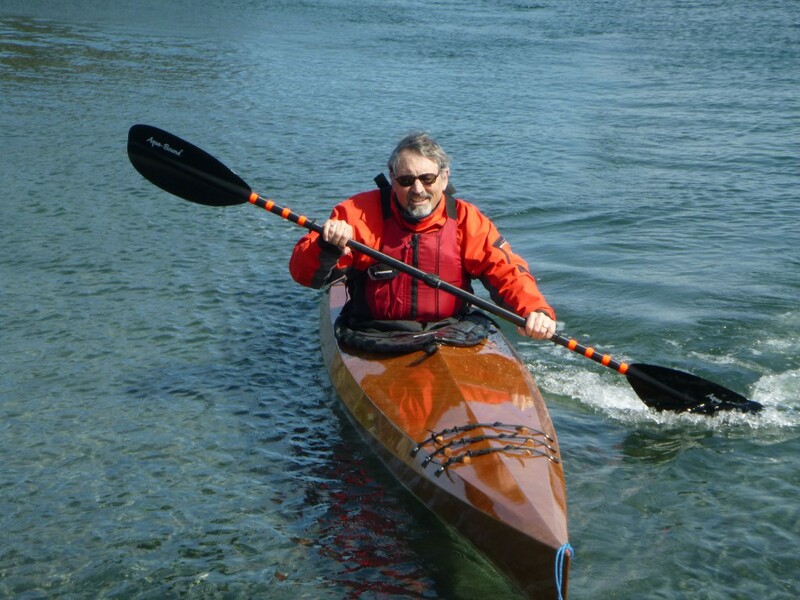 Thank you very much for the easy to build, joy to paddle and great looking kit. Just wanted to let you know I completed my Osprey Standard! I started it on May 31st and completed it on July 15th. It was quite an experience. I built it in my garage during our heat wave of some 7 weeks! Never had worked with epoxy and I quickly learned what the term “pot out” means, but was able to stay moments ahead of the affect in most cases. I purchased the kit without any previous kayak experience. Since I completed it I have had in in a couple of clear ponds and took a 3 hour clinic from a local kayak outfitter here in town. They were really impressed with my boat and don’t think for a moment that I haven’t enjoyed the compliments! I love it and can’t wait to get out on the water more!! I received my Osprey Standard in September and the first words out of my mouth were, “What beautiful wood grain!” I want to commend you on the precision cut of the parts and simplicity of your boat construction manual. I encourage anyone wondering if they could build one of your boats. 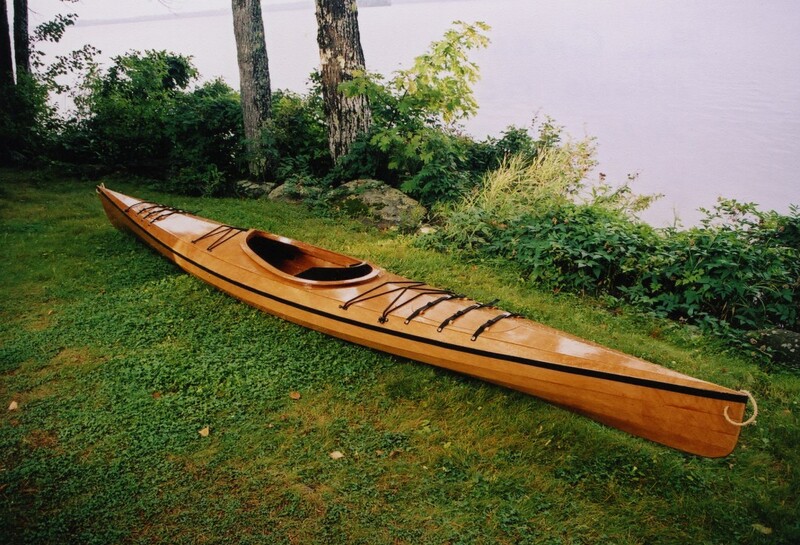 If you can read, and follow instructions, you can have a beautiful wood kayak. The wood grain flows from one panel to another. With the Missouri river at my doorstep and the Lewis and Clark Lake just up stream, I look forward to many hours of enjoyment. Speaking of Lewis and Clark, what they would have given for a fleet of Pygmy’s! I’ve had it in the water; its performance is up to its looks! Thanks so much for the wonderful experience – even the occasional frustrations! Yesterday, a little before sunset we put in the Osprey for its maiden voyage. I must say I was nervous – despite utter faith in the design and some faith in my craftsmanship, visions of the boat rotating on its long axis or launching into an infinite loop kept creeping into my brain. Beautiful is perhaps too mild a word. She tracked very nicely, even with some wind. Fast, stable, and really fun – all things you know but I have to say them! Last November I purchased an Osprey Standard and built it in my basement over a few months. The construction process went well. There was more sanding than I expected and I learned that a random orbital sander is essential to this project. For the final sanding I brought the boat out of the house to the garage… I am a male, 5’9″, 165 lbs and size 10 shoes and fit well in my Osprey Standard. The cockpit sides are cut nice and low and make you feel close to the water, yet I have never hit my fingers on the deck while paddling. Even with the cockpit like this it still rides well over waves and doesn’t let water in. 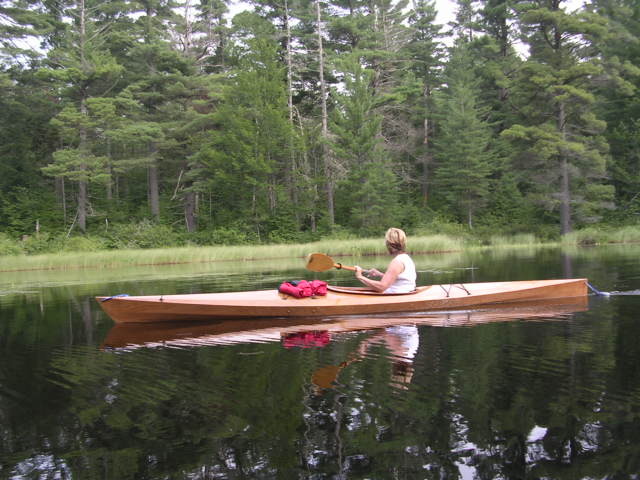 The boat definitely turns heads around fellow paddlers and earns lots of compliments and questions. The boat easily holds gear for a weeklong trip. With just myself in the boat 5 mph is maintainable by my GPS, loaded down with gear there is more drag. On flat water the boat tracks very well. 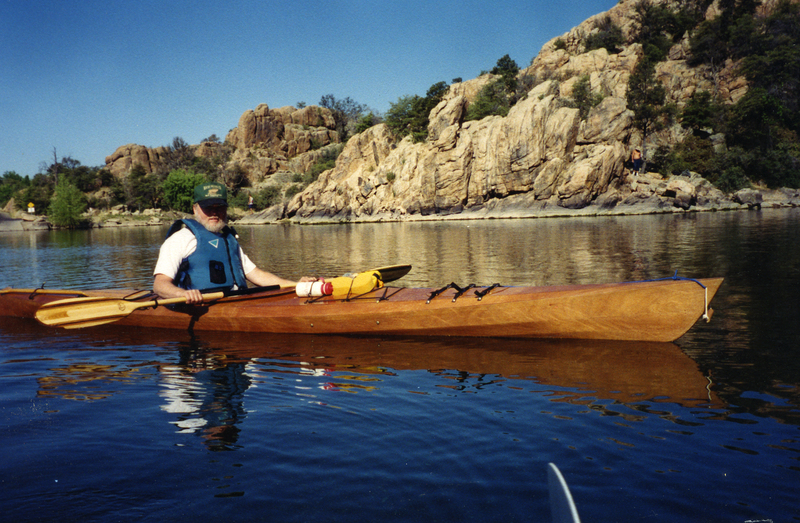 In 30 mph winds with waves breaking over the bow the boat is the most fun to paddle. Neither tracking nor weather cocking is a problem in the wind. A rudder on this boat would be more trouble than it is worth. 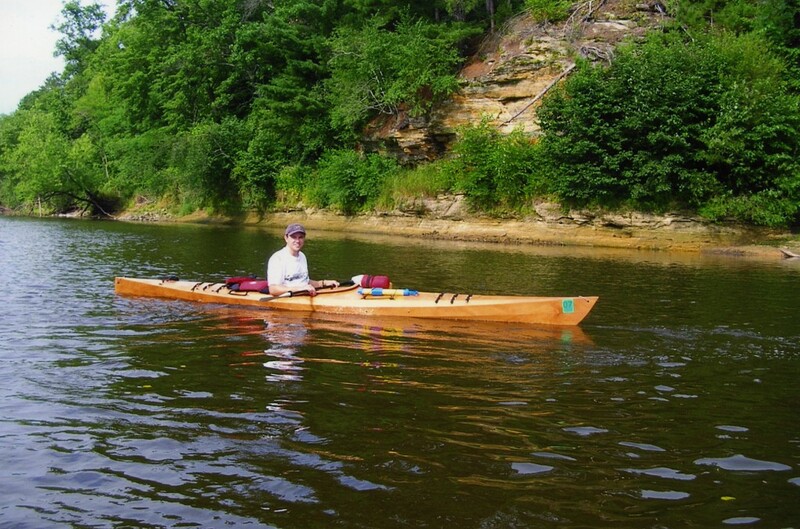 I like to find the windiest days to take the boat out for a paddle… Enclosed is a picture of me with the Osprey on the Black River in southwestern Wisconsin. 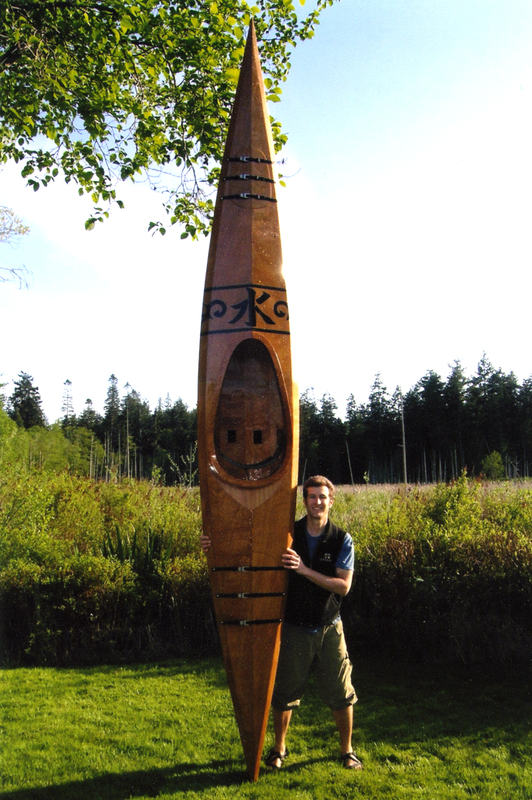 I am enclosing several photos of my kayak project, which was completed this summer. Last year I purchased an Osprey Standard kit and began to assemble it at my son’t lakeside cottage at Pushaw Lake, Orono, Maine where we spent a very enjoyable vacation. The hull was finished at that time. Then during vacation in Maine this summer, I was able to finish assembly and applied one coat of spar varnish. 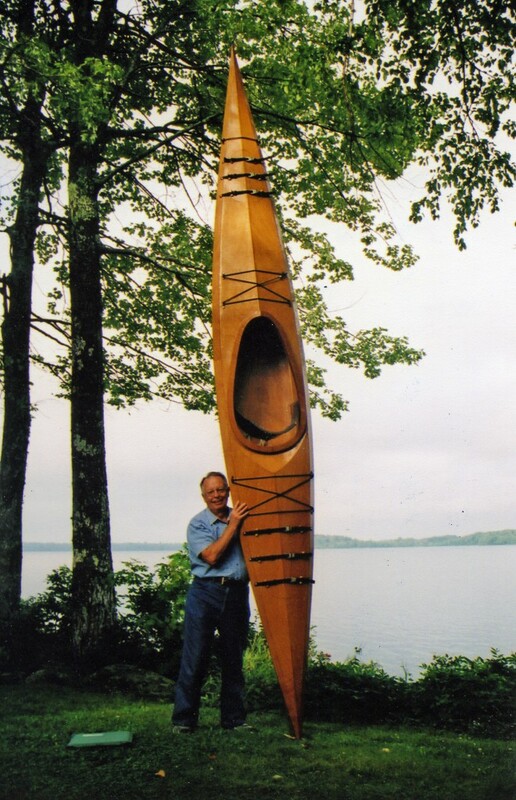 It is a very striking craft and I have had many compliments and admiring looks… I launched it on my 77th birthday. Woodworking has always been a hobby. However, I had no prior experience dealing with fiberglass, so that aspect was a challenge. Nonetheless, it was a very enjoyable project and there is a good measure of satisfaction in seeing and using the end product. It is light and faster than any stock fiberglass model I have seen on the lake. My friend and I just finished building our Pygmy Osprey kayaks and took them for their maiden voyage on the Huron River here in Ann Arbor. What a sense of satisfaction to sit in the boats that we had spent the last several months building. We soaked up every compliment from the people that passed by and there were many! Thank you very much for the chance to accomplish something that I know we will both cherish for years to come. We recently finished building an Osprey and a Coho. They were a labor of love and already the labor has paid off handsomely! They are so fun to paddle and easy because they track so well. We live in Anacortes and as of yet have stuck close to shore as I am 7 months pregnant, but look forward to many adventures in the islands. Thank you for a well-designed, beautiful product. Well, I did it! Bought an Osprey Kit in September at the Wooden Boat Festival. Couldn’t wait to build it. Got started but hit cold weather in Georgia. Finally had a breakthrough: to work in the living room for the cold season! That was in spring. Now I am completely happy. New boat is in the water and I am learning a new sport this summer. I really enjoyed every aspect of the building process. A delight to build and even more fun to show off! Keep up the great work! It’s hard to believe I ordered the Osprey Standard Kit two years ago. When I recieved the boxes and opened them, spread out all the pieces, I felt my first trepidation. And yes, all those boat parts sat in my basement for quite awhile until the completion of other projects and warmer weather arrived. Once I had the time and made space in my garage, I started. The construction went much faster and easier than I had anticipated. I started in late summer with the goal of finishing before winter. All told my kayak was completed in just over four months. The manual was easy to follow. Yes, there were times I had to sit down and read different steps over and over until the concept being explained took shape in my mind. The actual construction took a little over 90 hours. The final epoxy coat sanding, application of the varnish (I did 5 coats) and hardware installation took me another 40 hours. I’m very happy with how well it performs. I’ve had it out in several of the many rivers off of the Chesapeake Bay and out in the Pamlico Sound off the Outer Banks in North Carolina. It is stable and holds a straight line in currents and wind very easily. And yes, it has attracted attention. In fact on a hot Maryland summer day I was returning up the Severn River after paddling into Annapolis when a sailboat pulled alongside and offered me an “iced drink” so they could get a closer look at it. How refreshing and welcome that was! I am very proud of my Osprey standard. As I am sure you are aware one of your competitors is located nearby. My Osprey speaks well for Pygmy Boats and I am very proud of my kayak.